The deadline to have your entries submitted is May 18, 2015 or whenever the maximum number of teams is reached. You will be directed to a team information form only after a successful payment is made. It is vital that you complete this second step so we have your team information. Your team will not be registered in the Crawl until we have received the correct entry fee and team information. Just Sayin… Several of the cities SELL OUT before the posted close of registration. Failure to complete registration before the May 18, 2015 deadline (or before the Crawl is full) will prevent your team’s entry into the Crawl. In our cities that sell out, teams that have paid but have not completed the registration form by the posted close of registration will be refunded to allow additional teams to register. Don’t procrastinate! Get your team members together today! All participants are encouraged to take advantage of this program. For every 10 canned goods you bring to donate to a local food pantry, you will receive $10 in taxi vouchers. You must bring 10 cans to receive a $10 voucher. Cans will be collected at t-shirt pick-up the day preceding the Crawl, and from 12:00-2:00 pm the day of the Crawl. Canned goods will not be collected after 2:00 pm the day of the Crawl. These rates are only available Friday, June 5, 2015 and Saturday, June 6, 2015. Rates are based on availability. 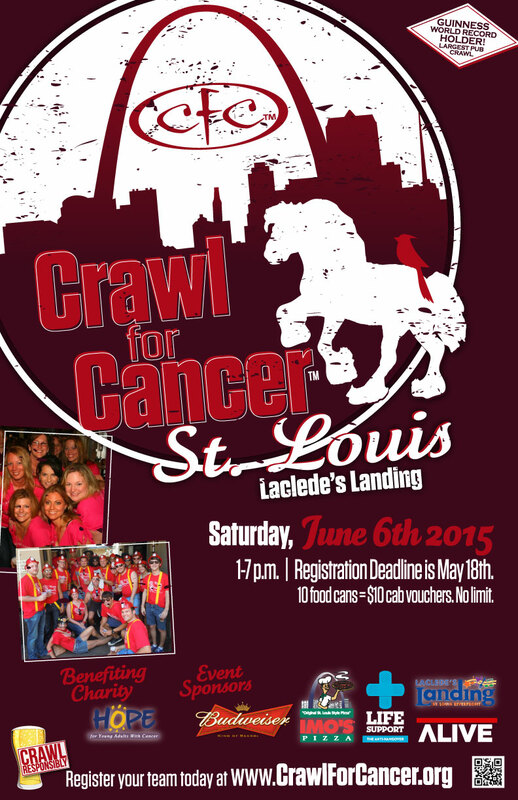 The pub crawl begins promptly at 1:00 pm on Saturday, June 6, 2015. The Crawl runs from 1:00 to 5:00 pm. Teams are invited to head back to the after-party at Big Daddy’s Laclede’s Landing where there will be music and beer until 7:00 p.m. There will be t-shirts available to purchase for $20 the day of the event and on Friday at early shirt pickup. This $20 buys one t-shirt and entry for one into the after-party at Big Daddy’s Laclede’s Landing. You MUST have a t-shirt for entry into the after-party. If we sell out of t-shirts, we will charge a $20 cover for entry into the after-party. Please note this is only if we sell out of t-shirts. Please make sober driver arrangements. Exception: If you want to donate canned food items for the taxi vouchers, you will need to drop them off at Big Daddy’s Laclede’s Landing between 12:00-2:00 pm. 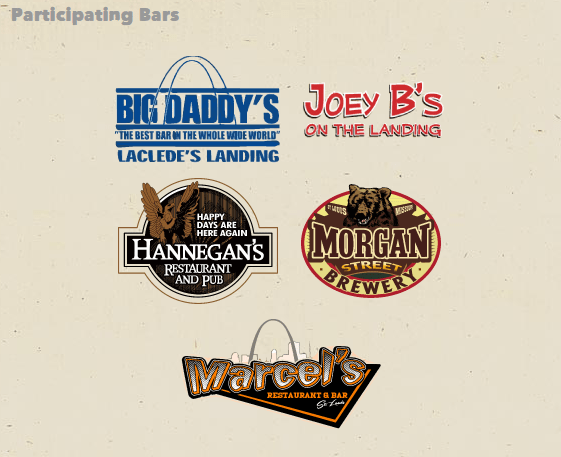 If not picking up on Friday, captains will need to arrive at Big Daddys Laclede’s Landing to get their team’s t-shirts and map/bar sequence. We often get requests for different teams to follow the same route. This isn’t a problem, but you must follow the instructions in your registration confirmation e-mail. Additional details can be found in our FAQ. Please understand that there is a maximum of 3 teams per pairing. Also, you must use our online pairing utility as we no longer accommodate pairing requests made in the comments section of the registration form. Pairings must be completed by May 18, 2015.